An important feature of a general medieval university education was the 'Dictamen', or Art of composition, which included rules for drawing up official letters, briefs and other legal documents. Treatises on the subject often include copies of real documents which serve as models; the can be extremely important for the historian, because they can preserve texts which do not survive in any other form. 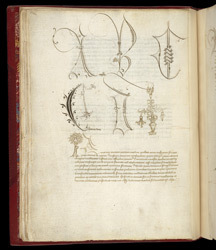 This thick volume, containing a variety of material, was owned by a monk of Canterbury cathedral in 1452. Despite containing works of a mainly administrative nature, this manuscript is often written and decorated very beautifully: here the scribe has written large calligraphic letters A, B, C, C, D above a model for a letter to a friend.